Home » Downloads » What should you consider when making a Will? What should you consider when making a Will? Making a Will can be a complicated process as there are many things to consider. Our solicitors are on-hand to help guide you through this process when you decide the time comes to update your will. In the meantime, we have created this guide to things you should consider when making a Will. This guide is intended to make sure nothing is forgotten about when making your Will. 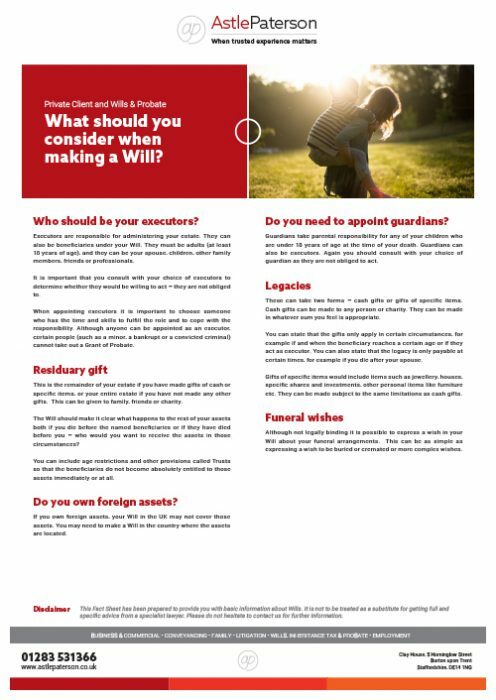 Download: What should you consider when making a Will?